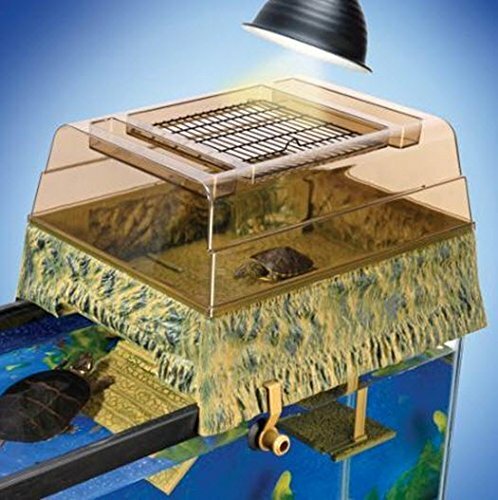 Reptology Turtle Topper Above Tank Basking Platforms provide your pet with a healthier, more spacious aquatic environment while giving you a new way to interact with your pet. Sculpted in a Jurassic style, the Turtle Topper is designed to sit over your existing tank giving your pet a more natural environment and allowing you to use your entire tank for water. The deeper water eliminates most filtration restrictions giving your turtle a cleaner more spacious area for swimming. Designed to fit most 10 & 20 gallon tanks, the Turtle Topper has a base 17" long x 14" wide x 10" high and will fit tanks that measure 11"- 13" front-to-back comfortably. Each Turtle Topper comes with a hanging platform that sits just below the water line so your turtle can rest while partially submerged. A docking ramp provides your pet an easy climb to the upper level where they can bask and eat. The basking platform has a clear top with ridges for mounting two clamp-style heat lamps (not included). A central easy-open grill allows heat to pass through while giving you easy access to your pet. Reptology Turtle Toppers are made of a durable plastic that is easy to clean and is safe for both children & pets. Can also be used over dry tanks to add a second basking level.